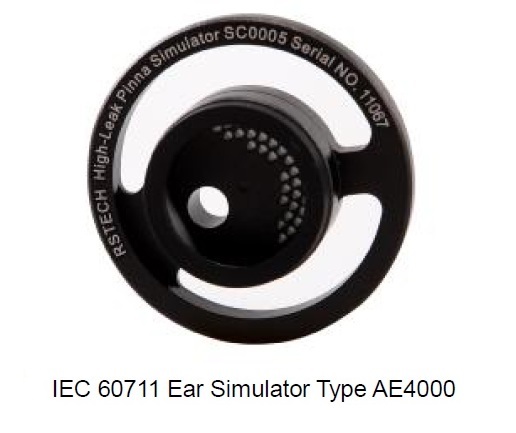 The IEC 60711 Ear Simulator Type AE4000 is used for measurements on supra-aural and supra- concha earphones, both sealed and unsealed, intended for wideband telephony application (100Hz to 8kHz). A well-defined leak from the cavity to exterior simulates the average real ear loss telephone handsets which are held either firmly (low leak grade) and loosely (high leak grade) against the human ear. This design complies with the following ITU-T Rec.P.57, Type 3.2 low-leak and high-leak simplified pinna simulators. Artificial Ears Type AE4000 consist of an acoustic coupler, RST condenser microphone and preamplifier and a base plate, which all parts are made of stainless steel and no any magnetic material. This assembly is shown in Fig.2, the IEC 60711 Coupler is screwed into the Simplified Pinna Simulator (low or high leak pinna,SC0004,SC0005 ), and Microphone Preamplifier is screwed into the IEC 60711 Coupler which includes a 1/2 inch microphone. All testing shall be performed with a Type 3.2 or 3.3 ear simulator, i.e. the type AE4000 Low or High leak pinna simulator. The Low- or High leak pinna simulator measures at the drum reference point (DRP). Measurements collected at the DRP shall be translated to the ear reference point (ERP), measurements made on any telephone handset can be referred to the equivalent sound pressure at ERP required to calculate loudness rating (including RLR, SLR, STMR etc.) or to check results against specifications, based on measurements referred to ERP. For most measurements, the DRP to ERP correction must be added to the data measured at the DRP in order to correct to the ERP. The effect is to remove a broad frequency response peak of about 10dB in the region of 3000Hz.